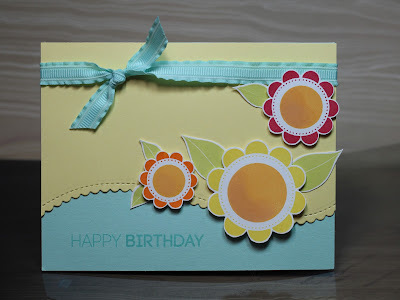 I've been playing along with the Papertrey Ink anniversary challenges all week, but didn't have a chance to photograph/blog the projects until today. For 2008, I decided to use Garden of Life. This remains to be one of my favorite floral sets. 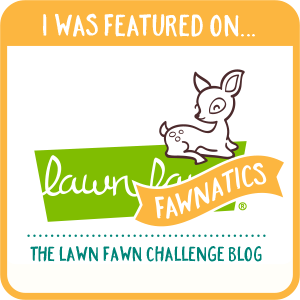 I love that it's whimsical and fun! For the first card, I used the scribbled rose image- how ahead of their time was this image? I think a few years later, scribbles became a hot item. Anyway, I stamped the line image only on vellum and embossed it in white. On the reverse I coloured each flower with Copic markers. I put that on a white card base and added a Spring Moss sentiment strip with a cut out flower embellishment. The flower was stamped with Raspberry Fizz, Lovely Lady, and Spring Moss. The greeting was Simply Chartreuse on Spring Moss. I decided to make a second card featuring 2008 product. 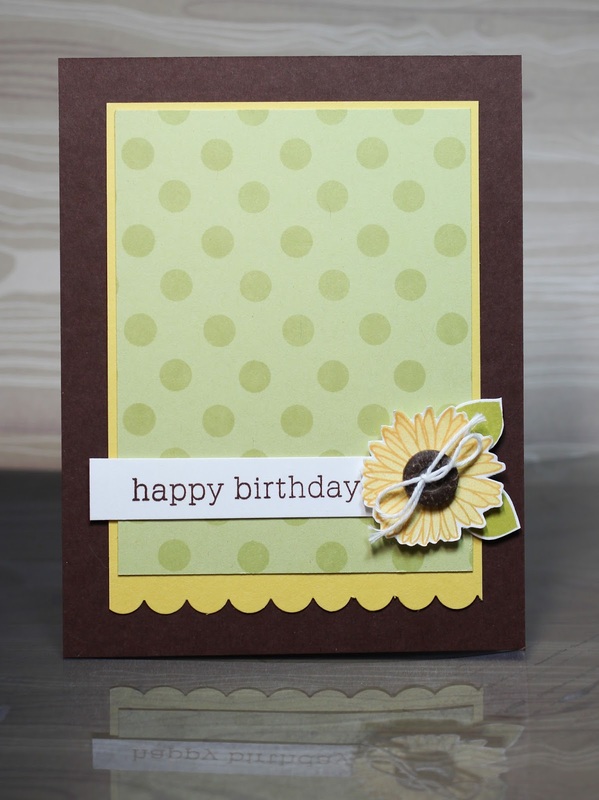 This time I also featured two other 2008 sets- Polka Dot Basics and Birthday Basics. This card is pretty straight forward. I stamped my polka dot background on Spring Moss and placed that on a scalloped piece of Harvest Gold. The card base is Dark Chocolate. I added a floral embellishment again. 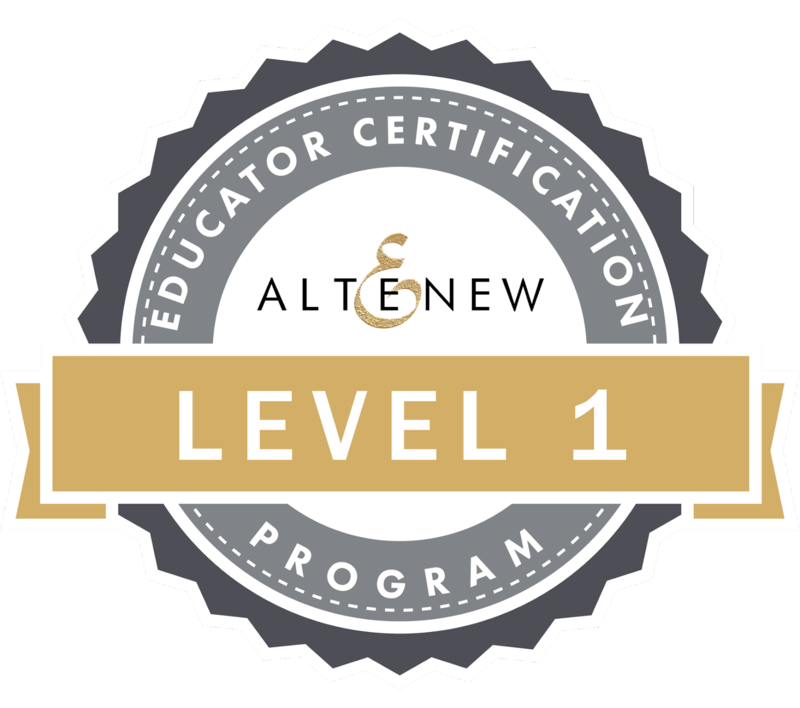 Although this time, I jazzed it up with a button. I don't remember what these ones were called, but PTI used to carry them- they are a wooden button. I have always loved them and typically hoard them, but thought I ought to start using them more! Onwards to 2009- I was happy to see Fruitful featured! I tend to have a soft spot for food themed stamps. I just find them super cute for whatever reason. For the first card, I went with a simple layout. 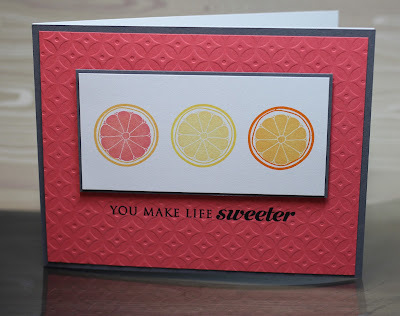 I stamped the citrus image three times- once in grapefruit colours, once in lemon, and once in orange. I was still finding the layout too simple, so I pulled out the Diamond impression plate and added that to my Berry Sorbet background. Just a note about the sentiment- if you intend to have a greeting on an impressed piece of paper, stamp it first!!! The greeting comes from Cupcake Collection- another one of my favorite 2009 sets. Colours- Grapefruit consists of Berry Sorbet and Summer Sunrise, Lemon is Bright Buttercup and Harvest Gold, Orange is Orange Zest and Summer Sunrise. 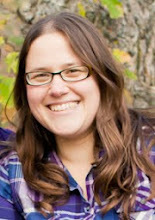 With all these looking back through the years, I also have been looking through my blogs. 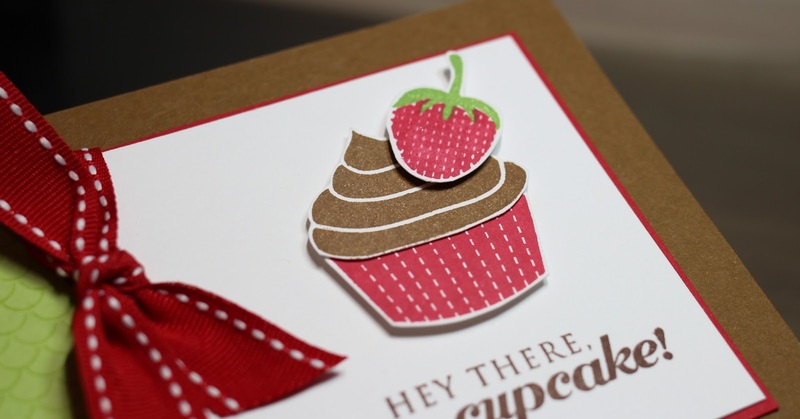 I came across one where I had used the cupcake image with a raspberry. 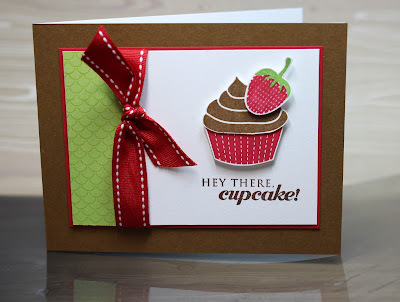 I decided since I had Fruitful and Cupcake Collection out, I would revisit that idea, and used a strawberry instead. I also finally used Cocoa Bean. I'm not sure that it will become as used as Dark Chocolate, but I quite like it as a brown/neutral. The stamped pattern on the Green Parakeet card stock is from the Background Basics retro set. For 2010, I was going to try and use one of the other sets, but Beautiful Blooms II remains to be one of my most used sets. I was inspired by Lizzie's subtle sponging on her card. I stamped the three sizes of flowers in Orange Zest, Harvest Gold, and Pure Poppy. The centres of each were Summer Sunrise and the leaves were Spring Moss. I played around quite a bit before settling on this layout. I brought out one my MFT scalloped stitched edge dies and also decided to incorporate some Pool Party paper and ribbon (SU!). The yellow panel is Lemon Tart. I have to say, I really love all of the yellows that PTI offers! I think this was my favorite card of the night! 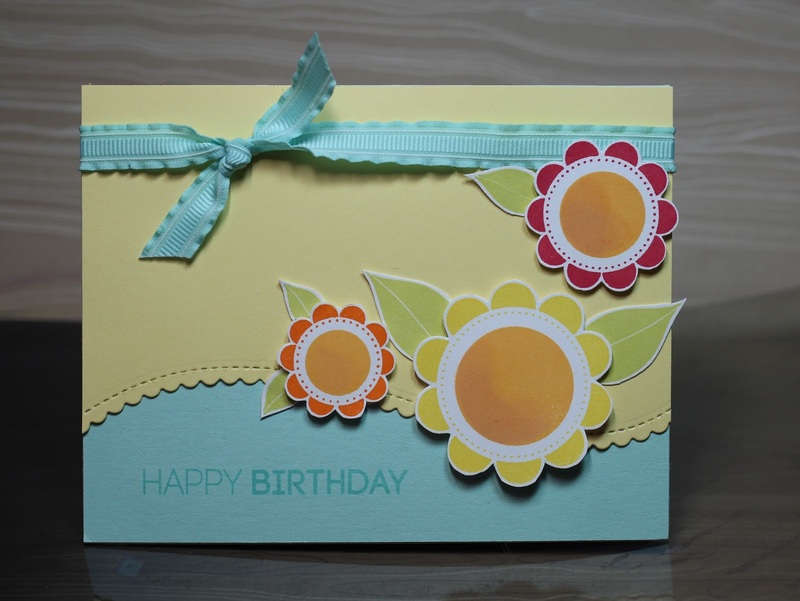 For 2011- the only set featured that I own is the Year of Flowers Collection, and although I've stamped with it, I don't know that I've ever completed a card with it. I still struggled with this set. I tried a few things Wednesday night and it was just NOT happening. So I set it aside and came back to it Thursday. I saw a layout on that I thought would work with this set and sure enough it did! I think the daffodil image is one of my favorites of the small version. I stamped that on white and coloured it in with Copics and fussy cut it out... even had to pull out the x-acto for part of it. 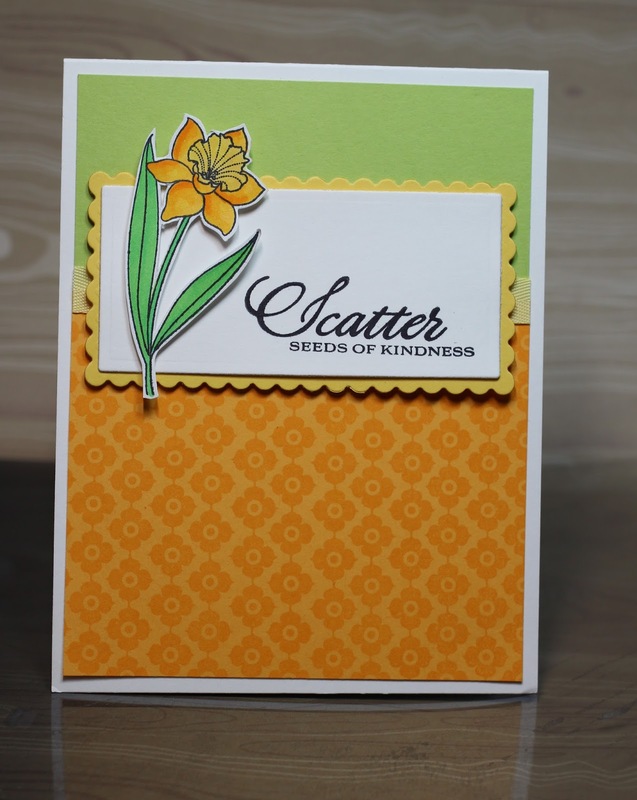 I really like the Scatter seeds of kindess sentiment in this set, so I made sure that my scalloped feature panel could fit that plus the flower. I pulled out another older product- the long scalloped rectangle nestabilities. I don't think I've used these in years, but they are quite nice and still trendy enough (despite not having stitches). I didn't want my background to be too plain, so I added background stamping from Petal Power. There are so many of the background sets from PTI that I love and use a lot! 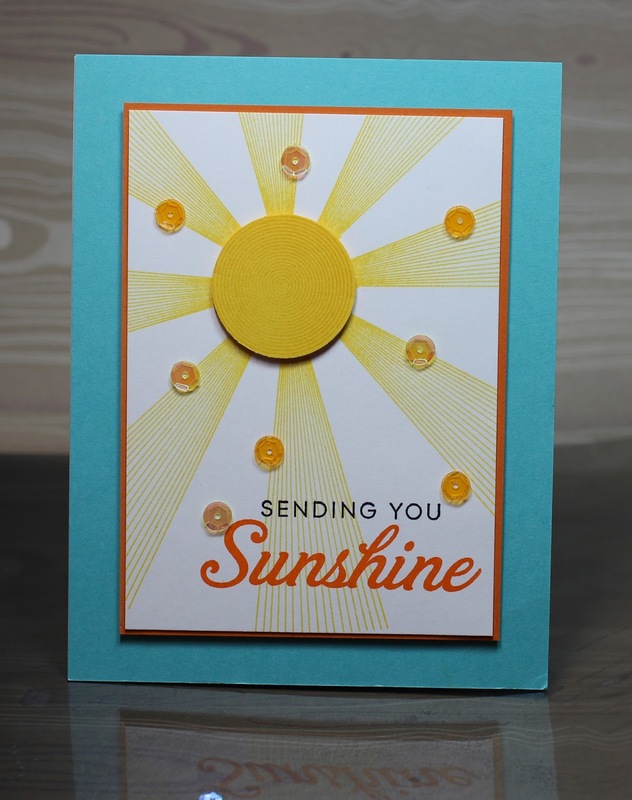 And finally, a card from 2012- I had to use Hello Sunshine. It's one of my favorites. 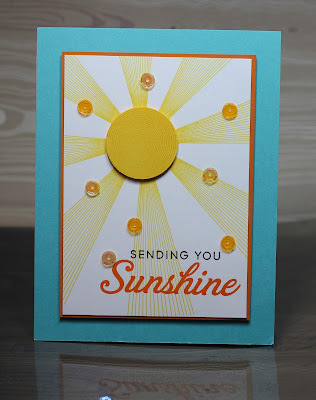 I love all of the ray options included and the various sentiments that can be built with the word sunshine. I'm sure I've made something like this before, but it was approaching the end of my Thursday night, so something quick and simple was needed. I stamped the rays with Bright Buttercup. The circle line image is also stamped on the Bright Buttercup circle centre, but it's a bit hard to see in the photo. I wasn't planning on added sequins, but there was an unfortunate water/ink spot that appeared to the left of the greeting, so I decided, why not add several! 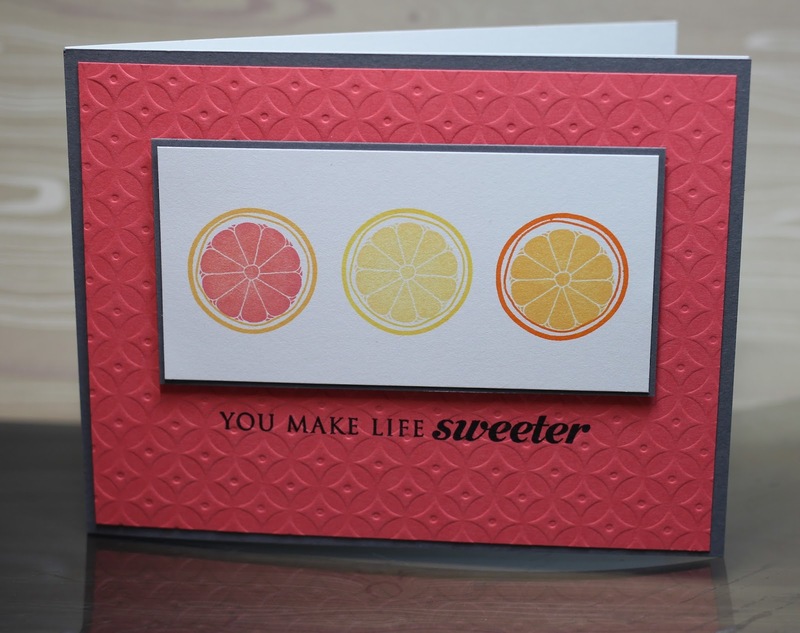 The panel was placed on Orange Zest and then on a Hawaiian Shores card base. 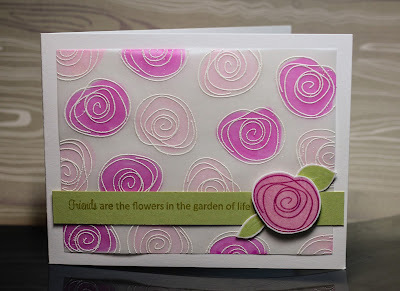 You Garden of Life scribbled circles is very trendy and quite pretty. I think that my favorite card is the same as yours, the Beautiful Blooms II card. It's so cheerful.